Tired of walking to your car to find it covered in ice and snow after a storm? 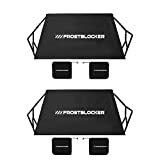 Tired of wasting gas running the engine trying to get the defroster warmed up? Are you basically sick and tired of winter altogether like I am and want to outsmart nature's wrath for once? 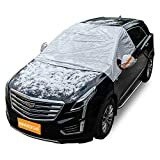 Then attach this cool new Windshield Snow Tarp to your car or SUV using its seven sewn in magnets before a snowstorm and let it snow, let it snow, let it snow. 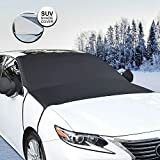 When it's time to drive after it snows, just lift up the cover, give it a quick shake, and fold it back up into its included drawstring pouch and toss it in the glove box or trunk until the next storm. It features twin flaps that secure down when the side windows are rolled up on them to keep the cover safely in place during high winds and even covers the windshield wipers and spray nozzles to keep them shielded and protected as well. It also works in the Summer months too to reflect the sun's rays during hot weather.